Gosh, it feels good to be back with a makeup post. Every Sunday evening, I love nothing more than to kick back with a cup of tea and take part in the #bbloggers chat; this week's topic was discussing all things Autumnal, which could not have been a better choice in my eyes. I'm one of those people that enjoys rainy days and dark, cold evenings. Not to mention loving the 'stereotypical' Starbucks pumpkin spice lattes and all things festive. During the chat, we were discussing some of our Autumn makeup favourites and each time I recommended a product, it gave me more of a desire to write about it. A key theme from us blogger ladies was dark lips and nails; these two things I have certainly accumulated my own favourites for. Each Autumn/Winter, my staple lipstick comes from Mac, which is no surprise. I absolutely adore 'Hang-Up' and last Christmas I was gifted 'Plumful' too, which has also become a firm favourite. Hang-Up is far more of a rich, reddy/burgundy shade, which is a very daring colour but I find that it compliments my fair skin and I love nothing more than to team this with a cosy knitted jumper and tartan scarf each year. As the name suggests, Plumful is a plum shade, but it's a lot less bold in comparison to Hang-Up; it's far more of a dark pinky-toned lipstick which would be great as a starting point if you're trying your first bold Autumnal lip colour. Both of the lipsticks are very creamy and last a good number of hours before needing to reapply. In the nails department, I absolutely swear by Maybelline's 'Super Stay Gel Nail Colour' in 'Midnight Red'. If you're anything like me and you find your nails chip easily, this is would be a great purchase for you. I can apply this with or without a topcoat and it will last a week or more without any signs of chipping; I always tend to apply 3 coats for an extra-thick, glossy finish and it's such a gorgeous rich burgundy shade. I actually bought this on a whim from Asos as it was only £4.50 at the time, which is very affordable in my eyes for such a long-lasting product. Sadly, it's now out of stock on their site but Superdrug also stocks it, along with a variety of other shades (which I'm inevitably going to stock up on too!). As my one has almost run out, I had a rummage through my nail varnish collection earlier in the week and found 'Malaga Wine' by OPI which is almost identical. The lasting power of Malaga Wine isn't quite so great as Maybelline's Midnight Red though, but the colour is a pretty close call. And of course, an Autumn post would not be complete without some coppery goodness. I will forever rave over the Nars 'Isolde' duo and I seem to find myself recommending this palette every time I take part in a #bbloggers chat. The colours are so complimentary, the payoff is great and the product also doesn't flake away upon application either (there is nothing worse than ending up with eyeshadow on the apples of your cheeks). With this, another coppery and far better-smelling product that I couldn't avoid mentioning is the Lush 'Sparkly Pumpkin' bubble bar. Despite getting absolutely covered in glitter for the above photo, I adore this product. I purchased it last year and I was so hopeful that Lush brought it back out for Halloween this year. I bought a bundle of Halloween & Christmas goodies from their site recently and the Sparkly Pumpkin was my favourite purchase. I love the colour, the glitter it adds to the bathwater and the scent. My flat smelt amazing whilst taking this photo, that's for sure. If you haven't already, I'd whole-heartedly recommend picking this up from Lush if you're an Autumn-obsessive like me. What are your favourite Autumn purchases? Do you have a 'go-to' Autumn makeup item for each year? these colours are so pretty ! 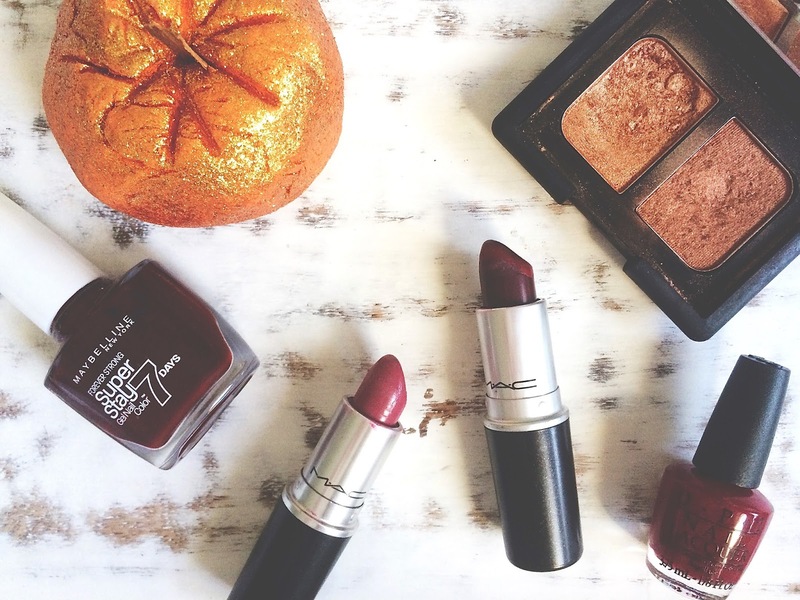 Love these dark lipstick shades! Also that bubble bar sounds amazing! I love plumful from MAC but also want to try darker shades like hang up!